For other uses, see Winch (disambiguation). Modern self-tailing winch on a sailing boat. Here, the line winched is a jib or spinnaker sheet which runs from the sail (upper left, not shown) to a block (lower right, not shown) and from there to the lower part of the winch. The handle is detachable to facilitate handling of the line. A winch is a mechanical device that is used to pull in (wind up) or let out (wind out) or otherwise adjust the tension of a rope or wire rope (also called "cable" or "wire cable"). In its simplest form, it consists of a spool (or drum) attached to a hand crank. Winches are the basis of such machines as tow trucks, steam shovels and elevators. More complex designs have gear assemblies and can be powered by electric, hydraulic, pneumatic or internal combustion drives. It might include a solenoid brake and/or a mechanical brake or ratchet and pawl which prevents it unwinding unless the pawl is retracted. The earliest literary reference to a winch can be found in the account of Herodotus of Halicarnassus on the Persian Wars (Histories 7.36), where he describes how wooden winches were used to tighten the cables for a pontoon bridge across the Hellespont in 480 B.C. Winches may have been employed even earlier in Assyria. By the 4th century BC, winch and pulley hoists were regarded by Aristotle as common for architectural use (Mech. 18; 853b10-13). The yacht Reliance, American defender of the 1903 America's Cup, was the first racing boat to be fitted with modern winches below decks, in an era when her competitors relied on pulley systems (block and tackle). The rope may be stored on the winch. When trimming a line on a sailboat, the crew member turns the winch handle with one hand, while tailing (pulling on the loose tail end) with the other to maintain tension on the turns. 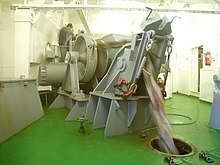 Some winches have a "stripper" or cleat to maintain tension. These are known as "self-tailing" winches. Winches are frequently used as elements of backstage mechanics to move scenery in large theatrical productions. They are often embedded in the stage floor and used to move large set pieces on and off. Off-road vehicles often carry a winch which may be electrically or hydraulically powered, and is wound with a wire cable. If the vehicle loses traction, the winch is used to pull it back to firmer ground. Lever winches are winches that use self-gripping jaws instead of spools to move rope or wire through the winch. Powered by moving a handle back and forth, they allow one person to move objects several tons in weight. Brand names include Tirfor and Griphoist. Example of winch designed for wakeboarding. These winches consist of a small four-cycle gasoline engine, clutch, and spool all housed inside of a steel frame. A rider is towed rapidly toward the winch as the rope winds around the spool. This is a vertical spool with a ratchet mechanism similar to a conventional winch, but with no crank handle or other form of drive. The line is wrapped around the spool and can be tightened and reeled in by pulling the tail line, the winch takes the load once the pull is stopped with little operator tension needed to hold it. They also allow controlled release of the tension by the operator using the friction of the line around the ratcheted spool. They are used on small sailing boats and dinghies to control sheets and other lines, and in larger applications to supplement and relieve tension on the primary winch mechanisms. Wakeskate winching is a growing hobby for many watersports enthusiasts. The winch consists of an engine, spool, rope, handle, frame, and some sort of simple transmission. The person being towed walks (or swims) away from the winch and pulls out all of the rope. When the winch is engaged, it pulls the boarder usually between 15 to 25 miles per hour (24 to 40 km/h). The winch may be mounted on the trailer hitch of a vehicle, set into the ground by stakes, or tied to a tree. These winches have been modified for use by skiers and snowboarders in cities. Gliders are often launched using a winch mounted on a trailer or heavy vehicle. This method is widely used at European gliding clubs, as a cheaper alternative to aerotowing. The engine is usually a large petrol, LPG or diesel, though hydraulic fluid engines and electrical motors are also used. The winch pulls in a 1,000 to 1,600-metre (3,000 to 5,500 ft) cable, made of high-tensile steel wire or a synthetic fibre, attached to the glider. The cable is released at a height of about 400 to 700 metres (1,300 to 2,200 ft) after a short, steep climb. An air winch, sometimes known as an air hoist or air tugger, is an air-powered version of a winch. It is commonly used for the lifting and the suspension of materials. In the oil and gas, construction, and maritime industries, air winches are frequently preferred to electric, diesel, and hydraulic winches because of their durability, versatility, and safety. ^ Piggott, Derek (1977). Understanding Gliding. Morrison & Gibb Ltd, London & Edinburgh. ISBN 0-7136-1640-7. ^ "What is an Air Winch?". Falck Productions. Retrieved 20 June 2012. ^ "Overhead Hoists, 1926.554". U.S. DOL, OSHA. Retrieved 20 June 2012. Look up winch in Wiktionary, the free dictionary. Wikimedia Commons has media related to Winches (sailboats). Arctander, Erik H. (May 1995). "Battery-powered winches". Popular Science: 103–105.